Brora Golf Club's Facebook page. Our PGA Professional's Facebook page. Our Head Greenkeeper's Facebook page. 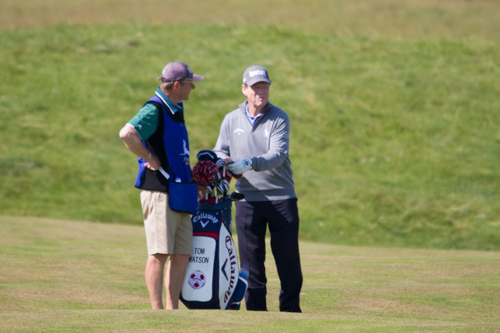 Brora GC was delighted when five times Champion Golfer of the Year, Tom Watson contacted the club to arrange a game. He arrived on 18th July to play and was greeted by a small band of fans and well wishers. Tom graciously signed autographs and posed for photos before teeing off with his brother, Tuck Claggett (retired manager of St. Enodoc, Cornwall) and Tuck's wife. Local member Ronnie Sim was his caddie for the round. It was a bright and sunny day with a stiff breeze helping on the way in. After his round Tom visited the Peter Thomson room and signed a flag for the club. Tony Gill, Secretary thanked him for visiting, “I would love to come and have another try one day” replied Tom before heading South to Birkdale and then Royal Porthcawl for the Seniors Open Championship.